Axes have allowed us to make our mark on the world—literally. Thanks to these beautiful sharp tools, we’ve brought the great sport of axe throwing to multiple North American cities as well as helped create thousands of memorable nights for our customers. We’re really lucky and feel almost indebted to axes. Without them, we wouldn’t be in business! We also believe axe throwing is artistic. To us, a wooden target dented and sliced up by steel blades is a thing of beauty, a true masterpiece. Every notch, groove and scratch tells a story of the thrower, the progression of their technique and of course if they accomplished hitting the bulls-eye. In some cases, they may even split the target entirely! 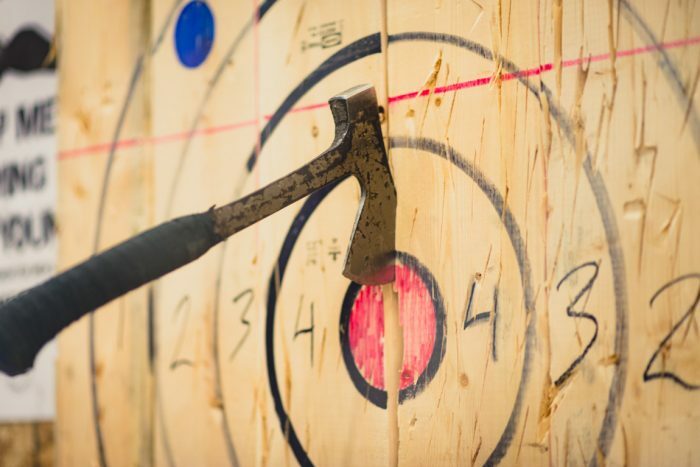 To ensure the axe throwing experience for anyone that visits a Bad Axe Throwing location is consistently awesome, we focused on the design of each space being just as cool as the activity itself. It had to represent our company but we also wanted it to be reflective of each city. We also wanted to avoid being generic at all costs and instead do something completely out of the ordinary. That’s when after lots of brainstorming, it finally hit us. We had to decorate our spaces with a totally different kind of mind-blowing art that most anyone could appreciate. This art had to be fun, cool, intriguing and powerful. We needed to paint our walls with graffiti. Bad Axe Throwing walls don’t just have any random slathering of spray paint. Each one is created by a local artist and tells a story designed to complement the ultimate axe throwing experience. Each has also taken hours upon hours of work involving a steady hand, precise stroke, and eagle-eye. In many ways, this kind of skill is similar to axe throwing itself. Graffiti and axe throwing seem to go hand-in-hand perfectly. Watching the progress of our walls literally come to life was exciting. Take for instance the wall above at Bad Axe Throwing Winnipeg. Artist Blake Lapinsky of Creative Persistence came up with the idea of illustrating one of the most iconic (and gory) battling duos: Itchy and Scratchy from The Simpsons. We think it adds the perfect amount of humour to the experience. After commissioning Lapinsky once, we were hooked on his talent. Since then, he’s painted a number of murals at many of our locations. Take a look at the Vaughan location below. For our Chicago location we wanted something completely unique and decided to be very particular with choosing an artist. 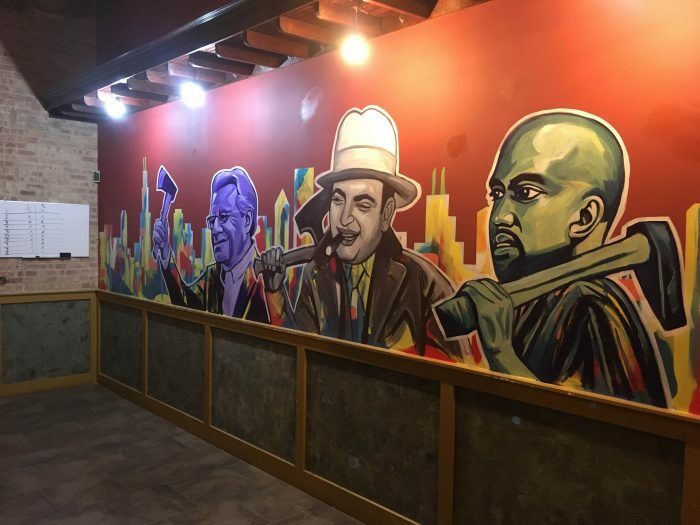 After finding renown artist Damon Lamar Reed, who was the mind behind impressive murals illustrating Dr. Martin Luther King’s dream come to life, we knew we had found the one. His skill for painting realistic portraits is incredible so it was only natural that he would suggest depicting famous local Chicago personalities like Oprah, Kanye and Jerry Springer. Each one holds an axe in their hand in front of a backdrop of the city’s skyline. We feel it’s the perfect representation of our first Bad Axe Throwing U.S. location. 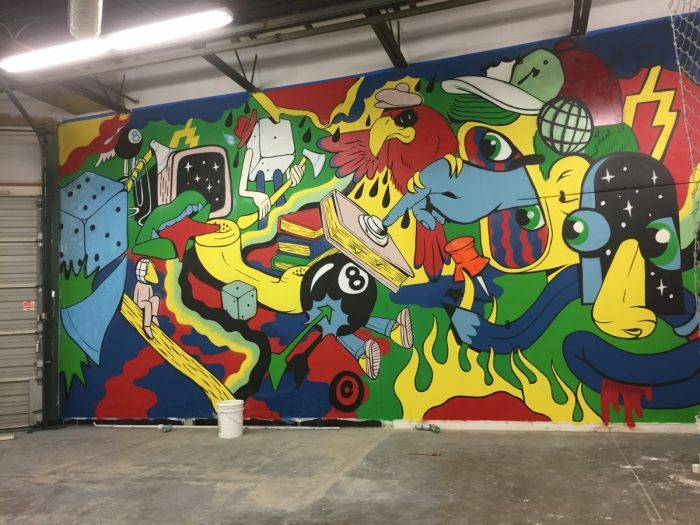 Our Bad Axe Throwing locations in Burlington and Kitchener feature the work of artist Richie Soto who we approached to do a ‘versus’ theme for each one. Soto took our idea and really ran with it, creating exceptionally detailed murals you could stare at for awhile. 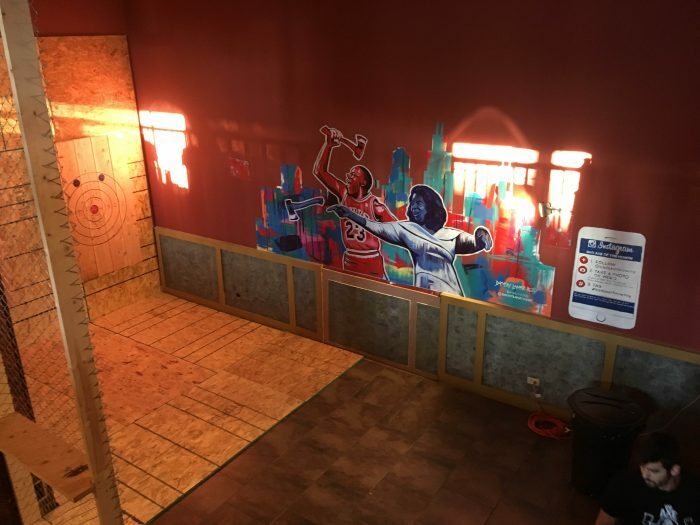 Below is a wall he did at our space in Burlington, the first Bad Axe Throwing location to open its doors. 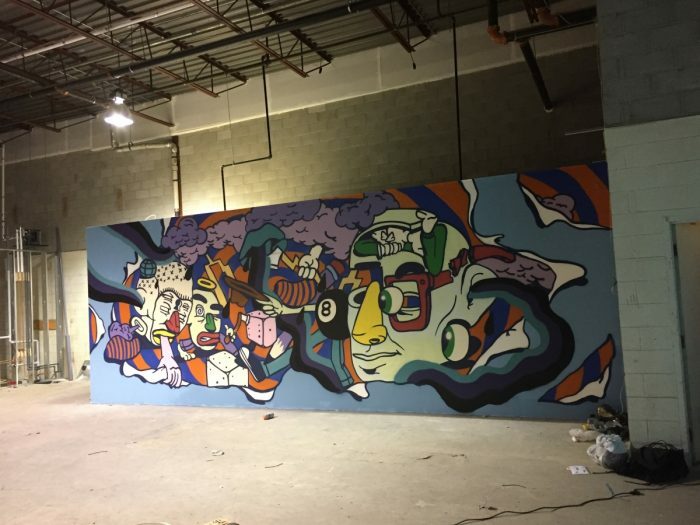 Check out more of his work in the next photo of our Kitchener mural, also designed by Soto. Supporting great, local artists has become a regular part of our business. It was an easy decision for us to choose an art form like graffiti, once steeped in controversy, to cover all of our walls. We’ve got a bit of our own rebel streak and we think that’s an imperative trait when you base success on encouraging the public to throw steel blades through the air. Our customers love the atmosphere graffiti murals create, especially as they provide a the perfect backdrop for axe throwing photos. We’re always looking to collaborate with more graffiti artists as we expand Bad Axe Throwing across North America, so if you know of any (or are one), hit us up!